We offer Breakfast, After School and Holiday Clubs for children aged 5 years to 12 years. Admissions Now Open for September 2018! Welcome to our new Templesprings Out of School Club. ​​We have been providing out of school music activities in the Essex community since 2008. In 2015 we ran our first Summer Camp which provided a unique learning opportunity that helped children build their confidence, self-esteem and life skills such as communication, teamwork, and leadership. We want to continue to provide such an experience, everyday, all year round not just during the holidays. Hence this new Out of School club is an extension of the great service we already offer to over 200 of our existing clients. We are part of the Out of School Alliance (OOSA) and all our workers and volunteers are DBS cleared. 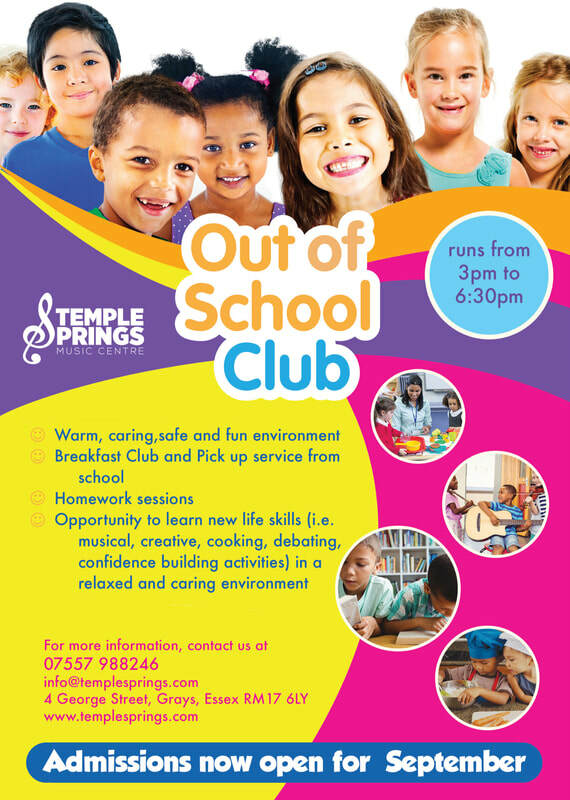 Our Templesprings Out of School club offers breakfast and after school care for children aged 5 years to 12 years. Our opening times are 7:00 am and we close at 6:30 pm. Part of our club service is taking the children to and collecting them from school. This is done via walking with our qualified team. The children are also provided with breakfast, snacks and tea.